Hitler again delays X-Day, this time till the 10th May. Francis Sayre is sent to Tokyo for talks with Foreign Minister Arita. 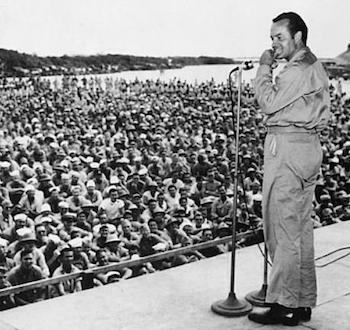 Bob Hope gives his first USO show at California’s March Field. US Secretary for War advocates US Navy protection for British supply convoys. Stalin declares himself ‘Chairman of the Council of Peoples Commissars’. The last Brigade of the British 10th Indian Division arrives at Basra with its commander Major General Bill Slim. Axis aircraft begin to land at the Mosul airfield in northern Iraq. Corregidor surrenders after five months resistance, with 15,000 prisoners taken by 1,000 Japanese. B-17’s from Australia spot the Port Moresby Invasion Fleet south of Bougainville. They attack the Japanese Carrier Shoho but miss. Admiral Fletcher is now convinced that the main Japanese force would make for the Jomard Passage between Papua and the Louisiade Archipelago and so organizes his forces for the coming battle. Hitler makes one of his increasingly rare visits to Berlin for Viktor Lutze’s funeral. In India, British release Gandhi from prison on medical grounds – Gandhi opposed India supporting the British war effort without a promise for independence. He had been imprisoned since August 1942. The last U-boats of the war sunk with all hands: U-853 and U-881 in the North Atlantic by US destroyer escorts, and U-3523 in the Baltic by the RAF. Axis Sally makes her final propaganda broadcast to Allied troops. The U.S. Fifth Army enters Austria from Italy. Breslau surrenders after an 82-day siege, during which the Russians inflicted 29,000 civilian and military casualties and took more than 40,000 prisoners. German SS troops try to crush uprising in Prague, Czechoslovakia. All of Italy is occupied by the Allies.